Situated in the southwestern corner of California, San Diego County is a large county spread out over 4,200 square miles. With a population of over 3 million people it is the second most populous county in California. The area is best characterized by its Mediterrean climate, majestic coastline, world-class resorts, renowned attractions and beautiful beaches. Local residents and vacationing tourists are also attracted to its slower pace of life and a laid-back, tropical small-town feel compared to most large U.S. metropolitan areas. 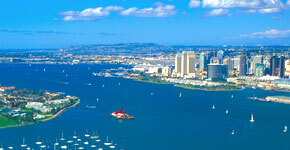 San Diego is also known for its longtime association with the U.S. Navy. Bordered by the Pacific Ocean to the west and Laguna Mountains to the east, the Greater San Diego area is composed of an eclectic mix of towns and communities in the surrounding hills, canyons and along its 70 miles of beaches. From the urban neighorhoods of San Diego's downtown to the suburban towns and villages, San Diego County provides a vast variety of living choices to fit any lifestyle. We have found a total of 7,334 listings, but only 500 are available for public display. Please refine your criteria, in order to narrow the total number of matching listings.